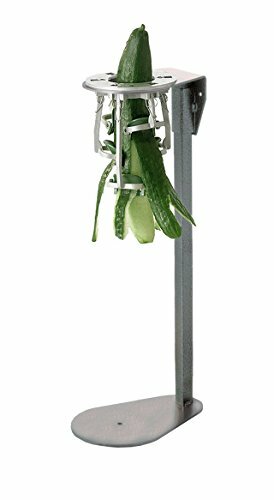 Tellier Cucumber Peeler with Painted Iron Stand by L. Tellier at The Primavera Blog. MPN: EP003. Hurry! Limited time offer. Offer valid only while supplies last. Cucumber peeler head made of plastic and metal. Stand made of painted iron. Head nests in stand but is unattached (and therefore removable). View More In Fruit & Vegetable Tools - Page 7. Cucumber peeler head made of plastic and metal. Stand made of painted iron. Head nests in stand but is unattached (and therefore removable). Assembled dimensions 5.5"W x 8.5"D x 19.7"H. Height between bottom of head and base of stand 13.3"
If you have any questions about this product by L. Tellier, contact us by completing and submitting the form below. If you are looking for a specif part number, please include it with your message.